Cigar was the first winner of the race back in 1996 and nine of the 19 runnings have gone to a horse trained in the States. The horse racing betting for this year’s Dubai World Cup again features some US based horses near the head of the market. Here, we take a look at four possible contenders to take the USA’s record in the world’s richest race to a 50 per cent strike rate. The Breeders’ Cup Classic winner was immediately pointed in the direction of Dubai after holding on by a nose to thwart Toast Of New York at Santa Anita last November. The four-year-old has not run since, but Bob Baffert knows what it takes to prepare a horse to win in Dubai. Baffert saddled Silver Charm in 1998 and Captain Steve three years later. Bayern’s participation in the Dubai World Cup is yet to be confirmed, but he will be a fascinating runner if he lines up in the 10-furlong feature. Trainer Art Sherman may not be keen on California Chrome going to Dubai, but the American Horse of the Year’s owners are eager to see the four-year-old run. 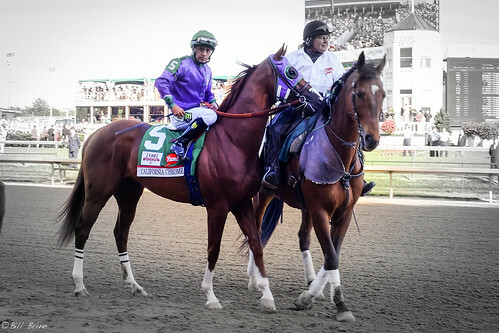 A four-time Grade One winner last year, California Chrome won the first two legs of the Triple Crown - the Kentucky Derby and the Preakness - before finishing fourth in the Belmont Stakes. He was beaten just a quarter-of-a-length by Bayern in the Breeders’ Cup before going on to land the Hollywood Derby. He finished second to Shared Belief in the San Antonio Invitational at Santa Anita on his first run of the year in early February. That has sharpened him up for the trip to Dubai where he has a chance of turning the tables on Bayern and Toast Of New York. Todd Pletcher’s lightly-raced four-year-old missed the Triple Crown races last season due to injury after being an impressive winner of the Grade One Florida Derby on only his second start. He rounded off last year with a third place behind Hoppertunity in the Grade One Clark Handicap at Churchill Downs. He looked good when winning the Grade One Donn Handicap at Gulfstream Park last month and there still looks to be untapped potential to mine. Constitution’s part-owners – Winstar Farm – won the Dubai World Cup with Well Armed in 2009. Another possible Dubai World Cup runner from the Baffert stable, Hoppertunity was slightly disappointing on his first run of 2015. He finished third behind Shared Belief and California Chrome at Santa Anita, but was beaten eight lengths in total. He had also been second to California Chrome in the Santa Anita Derby last April before missing the Triple Crown. At this stage, Hoppertunity is an intended runner in Dubai and, based on his victory in the Clark Handicap at the end of last year, he would go there with a squeak of making the frame.